With the release of Jurassic World just around the corner, we wanted to revisit the Steven Spielberg classic that started it all. 1993’s Jurassic Park has its share of great male characters (hello, Dr. Ian Malcolm! ), but is most notable for its abundance of female roles. Below is our list of the 10 best female characters in the film, as well as some little-known trivia that should impress your friends when you all see the next installment this weekend! Lex (Ariana Richards) is the granddaughter of the eccentric billionaire John Hammond, but would prefer it if you called her a hacker. Without her insatiable hunger for Jell-O or comprehensive knowledge of UNIX systems, the fate of Jurassic Park’s first guests would have been worse. A lot worse. Here’s to the second-best human female character at Jurassic Park! Though we really should pity Miranda, the sick triceratops, had she not decided to plop herself down and rest near the park’s automated Ford Explorer track, Dr. Sattler and Dr. Grant wouldn’t have decided to leave the car and delay the tour. Her sickness is partially responsible for the death of Gennaro, the blood-sucking lawyer. The youngest character on our list (by far! ), Peggy is the first dinosaur to have ever been born on camera. Though she very likely grew up to be a murderous beast, she was hella cute as an innocent newborn! Who could forget those precious coos she let out as Dr. Hammond gently removed her shell? It’s hard to find good child actors, but Peggy was a pro from the moment she popped out of her egg. When casting went out for a flock of gallimimuses, the first to audition were group of 30 sisters known as The Galloway Gals. After Spielberg and casting director Jane Jenkins viewed their audition, they were offered the parts immediately. Their authentic coordination as a herd wasn’t refined in the rehearsal process, but through a lifetime of running together as sisters. Unfortunately, one of the Galloway Gals didn’t make it out alive. In a freak accident that was caught on film, Stacy Galloway gave her life for her craft, and helped change the face of blockbuster cinema forever. Can you say, “ICONIC”?! Caroline is the first dinosaur the humans interact with in Jurassic Park, and is the subject of one of the most legendary reveals of all time. Not any dino could make Dr. Grant forcibly turn Dr. Sattler’s head with his hand, but Caroline sure could. It’s a small role, but a crucial one. I to the C to the O to the N to the I to the C! Rose is arguably the most beautiful lady dino in Jurassic Park, but that doesn’t mean she can’t pack a punch! Her attack on Nedry (Wayne Knight) is brutal for sure, but it’s also morbidly beautiful! More like a dilophoSLAYrus, am I right? In real life, Rose is a vegetarian and doesn’t use her venom beyond the occasional party trick, but she certainly sold her character’s unwavering appetite for flesh in the film! Helen, the sick brachiosaurus and Caroline’s younger sister, gets this high on the list for her comedic talents. Did you know that her now-famous sneeze wasn’t in the script? She actually had a cold and, instead of holding it in, let that sneeze out for the sake of comedy! Spielberg thought her sticky ad-lib was great (Ariana Richards did not), and kept it in the final cut. Named after the characters from Billy Wilder’s Some Like It Hot, Daphne and Josephine are the most memorable BFFs in the park. They are the Abbi and Ilana of the Jurassic period. The Tina and Amy of pack hunters. The Taylor and Lorde of theme park kitchens. Though their relationship has been fairly dramatic since filming (they fought through most of the ‘90s), they remain friends to this day. Yassss qween!! Though she is responsible for the death of Stacy Galloway (her attack on Daphne and Josephine was computer-generated, fortunately), Queen Isabella is by far the best female dinosaur character in Jurassic Park. Her iconic role will go down in history as one of the most effective and memorable in movie history, and we hear she even has a cameo in Jurassic World! Get that paycheck, Bella! Ellie (Laura Dern) was the only fully competent human on Isla Nublar, and her wide range of skills kept everyone alive when the men around her were either dying or getting injured. It was Ellie, after all, who made it to the shed and turned the park’s power back on—a trip that killed both Dr. Arnold (Samuel L. Jackson) and Muldoon (Bob Peck). 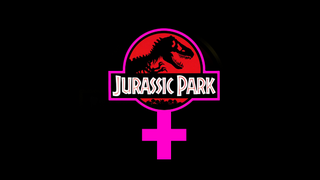 Three cheers to Ellie Sattler—the best female character in Jurassic Park!